Hoarse “chick-a-zee-zee, zee.” Song is 3-toned “fee-bee-bee; “bees” at lower pitch. Description: Sexes similar. 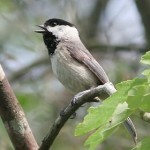 White eye-stripe; black cap and bib; and pale gray flanks. Gray above and paler below. Lacks crest. Rocky Mountain race tinged with buff on back, sides, and flanks, and have a broader white eyebrow. 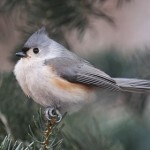 Habitat: Usually found in montane coniferous forests. 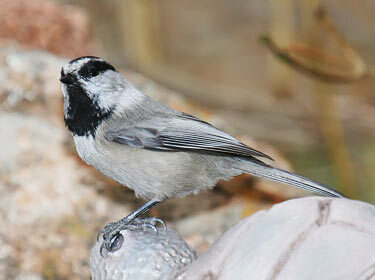 Winter vagrants sometimes visit residential birdfeeders. Where in Nebraska: Accidental. Rare winter visitor in the west. Mostly seen in Scotts Bluff County, but also seen in Lincoln, Dawes, and Sioux Counties. Field Notes: Throughout the western U.S., these birds frequently descend into lowlands and desert oases during the winter months. 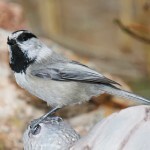 Fun Facts: Mountain Chickadees will often store seeds until later when they find a steady supply such as a bird feeder.